The weather outside is, uh, not so frightful thanks to the charm of living in Orlando, but this is still December so we’ve come to look forward to holiday spirit everywhere. We get to see beautiful Christmas trees everywhere at Walt Disney World, hear classic holiday music on the radio (Channel 18 on Sirius XM! ), and taste great cookies from our own oven. So what’s a chick to do to get a tasty drink with holiday flavors? 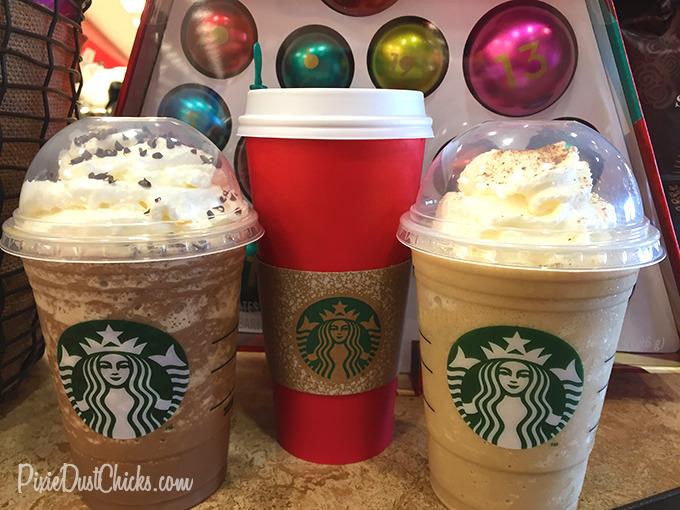 Thankfully, our friends at Starbucks have that covered… our favorite holiday frapps and lattes are back!! While some might haggle over whether to get a frosty frappucino or a toasty latte (which really depends on if you have snow outside or you’re still wearing sandals), we are all about the flavors. In the pic above, we’ve got it covered with a Peppermint Mocha frappucino, a Gingerbread hot chocolate, and an Eggnog frappucino. Welcome back old friends! To change it up a bit, we like to mix flavors sometimes. Just the other day we tried a Peppermint White Mocha latte. It was fantastic! So here’s the big question of the day: what’s your favorite Starbucks holiday flavor? And do you drink it as a latte, frappucino, or hot chocolate? Let us know in the comments below. « Starbucks Disney Christmas Ornaments! Caramel Brulee is my favorite for sure! Anything with caramel sounds good! We’ll have to give it a try. Thanks for the suggestion!